Dutch Uncles have chosen to make the world premiere of their album O Shudder at West Didsbury & Chorlton AFC's quarter final cup tie this Saturday (14th Feb). The airing at the MEN United cup tie in Manchester is ahead of the online premiere of the album with The Guardian. The band have also just announced a full week of instore tours to promote the album. Andy Proudfoot: “Between the five of us, we support three different football teams: Stockport County, Manchester United and City. This season we’ve adopted our local amateur team so we can call cheer on the same side every Saturday without breaking out into any arguments. It’s started to become a regular pilgrimage for all of us and we thought it would be fun to mark the release of our new album by sponsoring their biggest match ever… a quarter final cup tie against against Bootle." The fun kicks off just before 3pm with the team running on to 'Be Right Back', which the band have made available to stream today via Dummy. The track features backing vocals from Stealing Sheep. 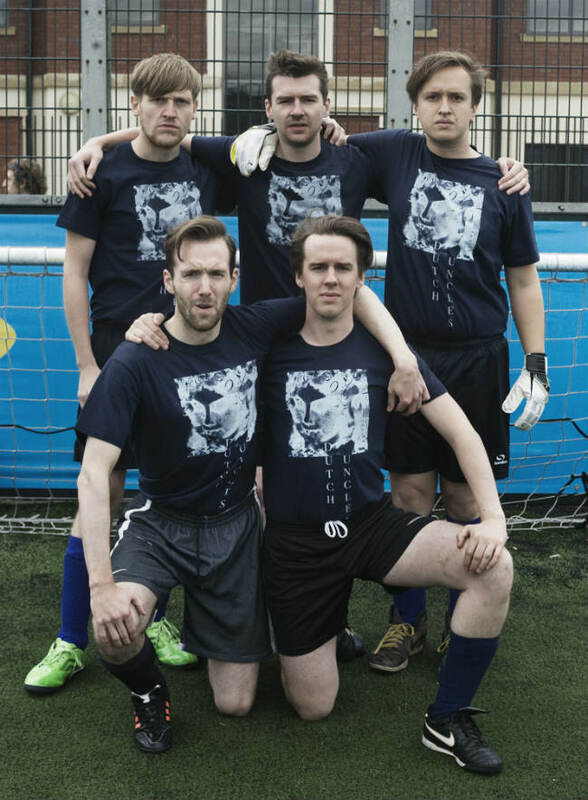 At half time, fans will be invited to take on Dutch Uncles FC in a penalty shoot out. Then, after the final whistle will be the world premiere of O Shudder: over the club's tannoy system and in the clubhouse. There will also be a raffle to win the match ball signed by the band and the team, and the band will be choosing the man of the match. “We’re banking on a West Didsbury & Chorlton win or it could make the whole post-match album premier thing a little bittersweet," added Duncan Wallis. "Celebrations and commiserations aside, we wanted to mark the occasion with a bit of fun and hopefully help the team win over some new fans... and maybe vice versa." West Didsbury & Chorlton, who play at the end of Brookburn Road in Chorltonville, compete in the North West Counties League and are enjoying a comfortable season currently sitting in mid-table in their second ever season at this level. 'West', as they are known, have enjoyed a rapid rise through local football having enjoyed three consecutive promotions from the Manchester League since 2011 and competed in the FA Cup for the first time in 2013.